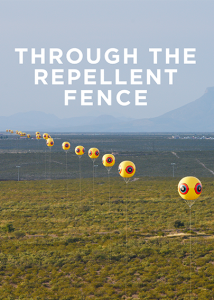 THROUGH THE REPELLENT FENCE: A Land Art Film follows art collective Postcommodity as they construct Repellent Fence, a two-mile long outdoor artwork that straddled the U.S.-Mexico border. Postcommodity consists of three Native American artists who put land art in a tribal context. In 2015 the artists worked with communities on both sides to install a series of 28 huge inflatable spheres emblazoned with an insignia known as the "open eye" that has existed in Indigenous cultures from South America to Canada for thousands of years. The artwork crossed the border a mile in each direction and symbolized a suture stitching back together cultures that have inhabited the land long before borders were drawn. Scenes with other artists and intellectuals working in the land art realm provide context and insight as well. These include scenes with Chris Taylor of Texas Tech University's LandArts of the American West program, writer Lucy Lippard and Matt Coolidge of the Center for Land Use Interpretation.